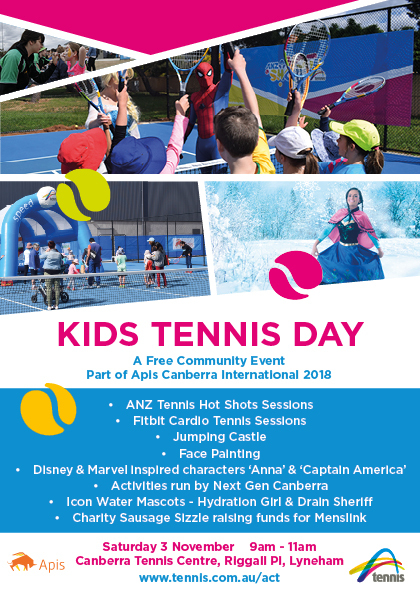 Kids Tennis Day at the Apis Canberra International will be held at the Canberra Tennis Centre on Saturday 3 November from 9.00-11.00am. There will be a host of activities for the kids, as well as the chance for parents to get out on court. We will be giving away ANZ Tennis Hot Shots racquets (21, 23, 25 inch) to the first 100 kids aged 12 and under through the gates. Enchanted Canberra’s Captain America and Anna from Frozen. The Canberra Tennis Centre is located at 3 Riggall Pl, Lyneham. Parking is available across the road near the hockey centre.